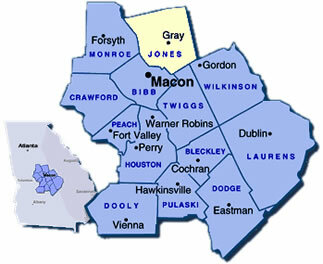 Jones County is centrally located in Georgia and only minutes from Macon and Milledgeville. I-16 and I-75 are within easy access as well as major highways such as US 129, GA 11, GA 18, GA 22, GA 44, and GA 49 run through the county. Gray is the county seat and is conveniently in the center of the county with many of the major highways leading into the city. Jones County is noted for its excellent school system in preparing students for life beyond high school. The Piedmont Wildlife Refuge, Jarrell Plantation, Old Clinton, are a few of tourist attractions for this county. Annual activities include Old Clinton War Days, held the first weekend in May, and the Day Lilly festival, held the first weekend in June. Many other activities are held throughout the year. Jones County is a friendly place to live where you can enjoy the peace and quiet yet have the convenience of the larger cities when you need them. Are you moving to Gray or relocating to Jones County? Use our quick search to find homes for sale in Gray Georgia and Jones County. If you are moving to or relocating to areas outside of Gray or looking for a more customized home search, please use our customized residential property search. View our Macon Georgia Real Estate Page.